OK, I have to throw my hands up and admit – I haven’t been blogging as much in the past few weeks. I’m sure others will sympathise – I’ve seen a few bloggers recently deciding to close down blogs to concentrate on new projects and jobs. I started a new job in August as a Learning Technology Support Officer with the University of Nottingham. My post is based centrally in the Learning Technology Team in Information Services and involves supporting most of the learning technologies at the University, particularly e-assessment (more on that later) and the VLE. Words like, learning, support, e-learning, engagement and delivery are key here. The team I work with is varied and talented, including programmers, developers, technical experts and trainers, and we offer support and consultancy to all academic staff. We now have a team blog and we tweet as @LTNottingham. In the context of a busy workload, maintaining a personal elearning blog as well as supporting the Learning Technology Team blog at work means I have to be more efficient in planning ahead for gaps and events. 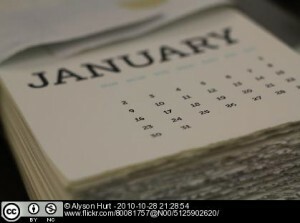 I found myself in need of a blog planning calendar for 2011 so I have created one and provide it also for download if anyone else can make use of it! I find it really useful. I previously blogged about year planning on my WordPress blog, so that’s the place to go to find out more about how to plan using this calendar.